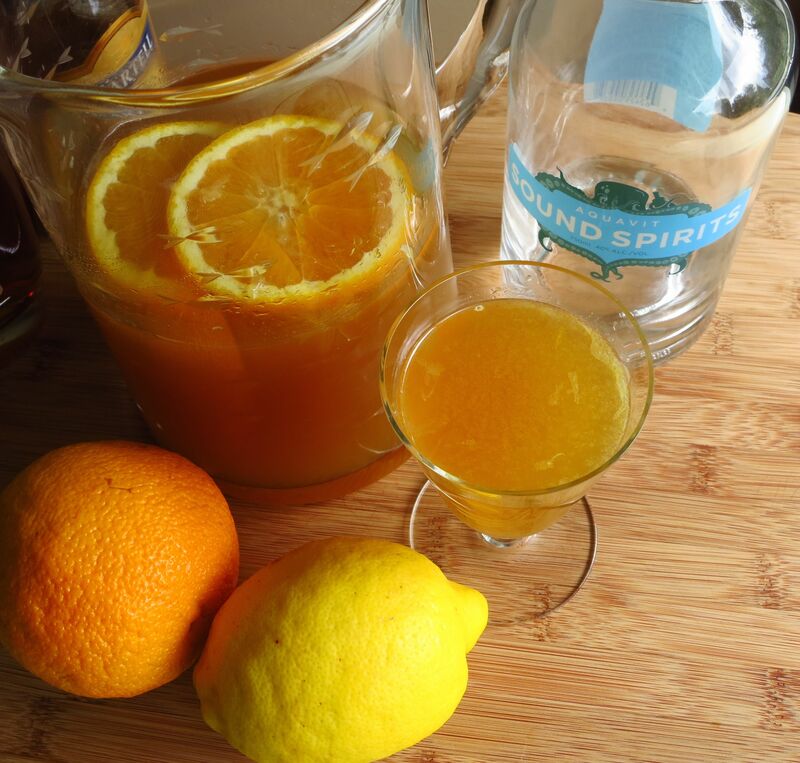 Recently Drinkwire put forth a challenge to create a unique punch recipe for the upcoming 4th of July holiday. We’re all about challenges around here, so we decided to give it a whirl. 🙂 With that in mind, we set out to create a couple of new punch recipes. Shaun felt that with some re-imagining, our Sunbreak cocktail might make an interesting punch. Since that has aquavit in it, it inspired Christa to experiment with that spirit as well, and we ended up with two aquavit-themed punches. 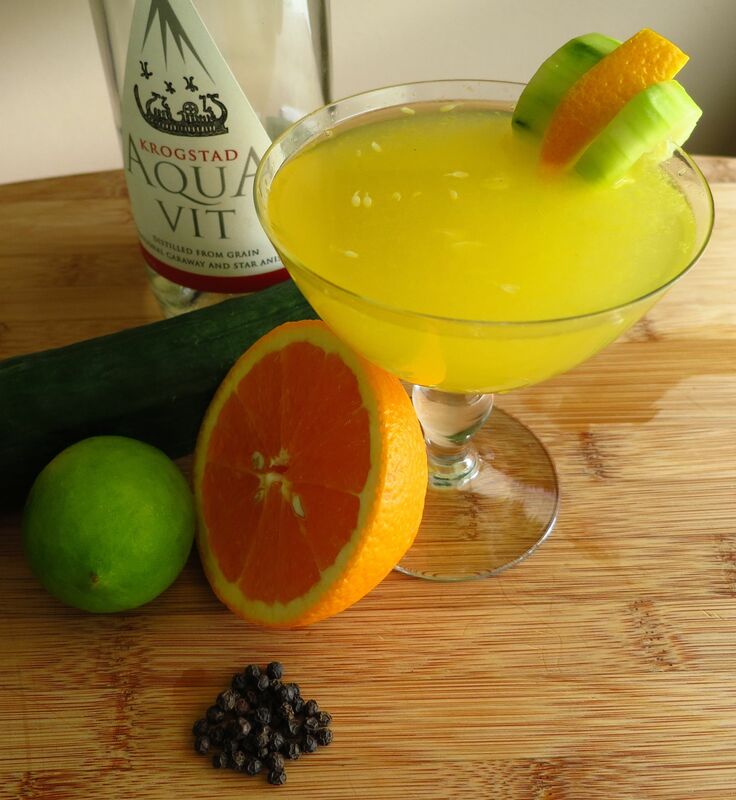 If you’re not familiar with aquavit, check out one of our other posts highlighting it. It’s a very interesting spirit, so read on to see what we came up with. Mix together all ingredients except the soda. Let chill in the fridge for several hours. To serve, add soda and enjoy! Nose: Orange peel, lemon peel, caramel-y grape spirits, plus dill, caraway and anise notes from the aquavit. Palate: Sweet orange and dill to start, followed by a big wash of lemon and orange peel. Sweet rich caramel and wood notes from the brandy and bourbon on the mid-palate. Big spike of sweet lemon from the mid-palate into the finish. Finish is more aquavit, caraway and anise with a little bit of spice. Christa thought aquavit would make an interesting base for a punch, with it’s balance of sweet and savory flavors. It was a plus that neither of us could track down any punches that had aquavit as the primary liquor (after a cursory effort). She started by adding cucumber and black pepper to give more structure to the savory elements of the spirit, then moderated and lightened that with some citrus and a touch of sweetness. The result is a refreshingly bright and herbal concoction. Lightly crush or crack the peppercorns. Let sit in aquavit for 20-30 minutes depending on how peppery you want it. Feel free to use more peppercorns or let it sit longer if you like some bite 🙂 Strain. Lightly muddle cucumber slices; do not crush, just bruise. Mix all ingredients except soda in a container and chill for an hour or two. To serve, add soda and drink! Nose: Cucumber, caraway, anise, orange and lime. Faint black pepper. Palate: Cucumber, caraway and dill to start. Citrus and black pepper on the mid-palate. Big bite of sweet anise and caraway on the finish. Cucumber backbone throughout. Peppery bite continues from the finish to the aftertaste. Nice balance of savory and sweet. Aquavit is a very under-appreciated spirit in our minds, kind of the red-headed stepchild compared to gin. Which is too bad, since it adds some really nice complexity to cocktails, plus savory notes that you just don’t expect. So we were happy to be able to use it to good advantage in our punches this week. Both punches turned out very nicely in our opinions. Be forewarned, they’re both quite strong (go figure!) and easily drinkable. So unless you want your guests under the table in a hurry, we suggest small punch cups. 🙂 In any case, we hope you feel motivated to mix up a batch at your next barbecue or garden party and give them a try. 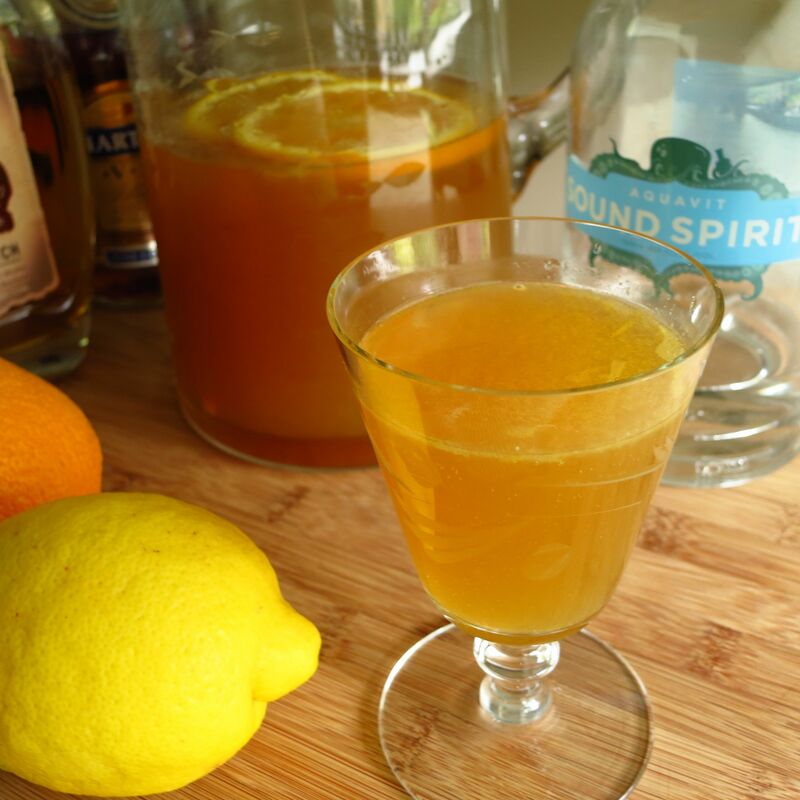 This entry was posted in aquavit, bourbon, brandy, lemon juice, moscatel sherry, orange juice, Original Cocktail and tagged esperanto cocktail recipe, esperanto punch recipe, fenris cocktail recipe, fenris punch recipe, house spirits krogstad aquavit, punchofjuly, sound spirits aquavit. Bookmark the permalink.